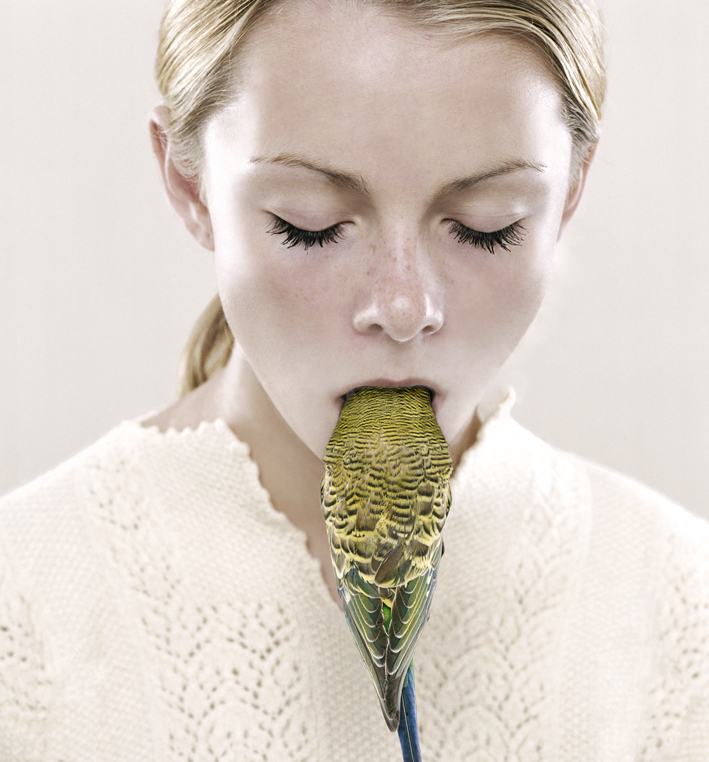 To bring in the new year we have the pleasure of interviewing Petrina Hicks! Petrina is an Australian contemporary photographer known internationally for her work which delves into the worlds of female identity, mythology and history to create compelling works shot with chilling precision. Using her background in commercial photography Petrina plays with the duality of perfection and imperfection toying with the viewers sense of comfort and order. Drawing on the aesthetic of glossy magazine’s she builds a world which questions what it means to be human. Petrina, it is such an honour to have you be part of our artist feature this month. To start off, can you describe yourself in three words? What is it about fine art photography that moved you away from commercial photography? I was seeking more complexity in image making, more freedom, I was interested in investigating photography from another perspective as I felt limited within a commercial arena. Your work includes a clean aesthetic, sensual elements and a twist. I have previously read that you ‘seek to attract and repulse’ the viewer. What personally drives you to create works of such duality? Photography is a trickster, a slippery medium, playing with the commercial aesthetic – I tried to weave subtle manipulations and ruptures within the images. Trying to achieve a sense of polarity, tension, push-pull effect within the one image. So the viewer cannot resolve the image, so no satisfactory narrative or meaning can be derived, I aim for ambiguous images. Commercial photography seeks to evoke desire, with some of my works I aimed to create images that were as equally desirable as undesirable. With many years experience of being an assistant for commercial photographers and having been one yourself, what key aspects of commercial photography do you still use in your work from an image making point of view? I employ all the key aspects of commercial photography from a technical and production perspective. It’s just the research and creative process that differs. I still shoot on film, and this is the exact process I was employing commercially, I never took to digital, there is something very unsatisfying about digital for me, I always feel disappointed with the results. I have been using the same medium format camera (hasselblad) for the past 15 years. Once the film is processed I get high resolution scans done, and finish the images in Photoshop. To my eye there is more integrity in the final object – the large prints that are exhibited. How much preparation goes into a body of work? Can you describe your creative process? It’s a continually evolving process, always changing. The research and enquiry is ongoing and becomes refined through the physical act of shooting the ideas/concepts with a camera to see if they translate as photographs. Then refining and adjusting the ideas, so they may translate better. This process of refinement can take 6-8 months if working towards an exhibition. Photography is a very literal medium, there are all these fines lines between; commercial/art, didactic/ambiguous, enigmatic/contrived….and I constantly aim to tweak these subtle aspects. You tend to photograph women, girls and animals. What draws you to these subjects? I probably stick to subject matter I know, so it’s a genuine enquiry and personal. I’m fascinated with the human-animal relationship, and often employ animals to represent aspects of psyche, as way of exploring identity. To enquire about ‘human identity’ involves enquiring about animals, as humans define themselves in comparison to all other creatures on earth. What makes us ‘human’ as opposed to ‘non-human’. I’m also fascinated with the history of female identity/representation in art, media and popular culture, and tracing the cultural, social and historical influences of this. 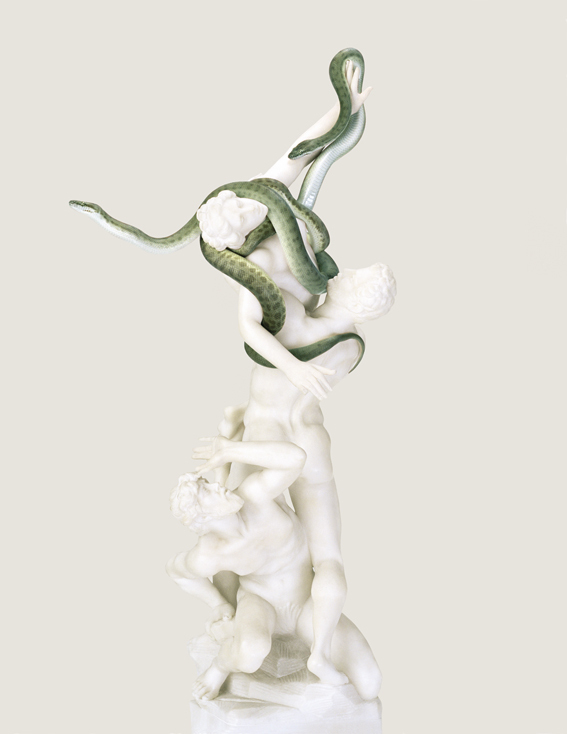 Being an exhibiting artist, what are you looking for in the printed version of your work? Does this influence the way you edit? I always have the final object in mind – the print. I never create images for a computer screen, all decisions I make are based on how I would like the final print to look. This is why I shoot on medium format film, there is a tangible, nostalgic, visceral feel to film grain that I enjoy seeing in print. I can of course add film grain in Photoshop, but it feels like cheating. I enjoy a classic/traditional approach to photography out of respect for the medium. It’s a more disciplined process, exposures and lighting need to be spot on. I also aim to create everything physically in front of the lens, rather than manipulate in Photoshop in post-production, my process feels like creating sculptures (female, animal, object) in studio, lighting them and then recording the sculpture on film. The use of plain backgrounds enhances the sculptural qualities of what is photographed. You have created many award winning portraits, challenging what a portrait is. In your opinion what makes a good portrait? There is no definition of a ‘portrait’ really, it’s a blanket term. Throughout history the concept of portrait has changed also; to document, to romanticize, to reveal one’s soul, to trick, to manipulate, to promote, to attract etc….yet all are defined as ‘portraits’. A selfie taken for social media has entirely different intention behind it to a photographic portrait taken by an artist, a police officer, a doctor, a photojournalist a commercial photographer etc. so it’s hard to answer what makes a good portrait, I would say the ‘intention behind the portrait’ is what defines it, and this is often obvious when viewing photographic portraits. Being an Australian photographer, your work is both successful nationally and internationally. How did you go about gaining acclaimed attention for your work? The galleries that represent my work: This is No Fantasy + dianne tanzer gallery (Melbourne) and Michael Reid (Sydney) and originally Stills Gallery (Sydney) are very global in approach. These galleries have exhibited my work at international art fairs and through other international platforms. Michael Reid has a successful gallery in Berlin, and good network in Germany. Where do you see the future of Australian photography? I’m not really sure? It’s hard to predict the future of photography in general. You have also been a part of a variety of international art residencies and exhibited in galleries across the world. What are the differences between the Australian and International art scenes? Countries like UK, Germany, France, USA, Netherlands etc have history of fostering artists and supporting the arts, starting at secondary education level through to tertiary. Art and culture really defines these places. So to be an artist there feels more valid somehow. How important is it to stay authentic to your own personal style in your work? Do you have any advice for aspiring fine art photographers? I think photography is accessible to everyone now, everyone uses a camera on a daily basis. It’s impossible to define what ‘photography’ is or what it means today. I think authenticity is an important word, and intention. A camera can be wielded in so many ways. I’m drawn to photographic works that are authentic and genuine, and personal. Where the camera becomes just a tool the artist is using to tell a story or communicate an idea, there needs to be a purity in intention, otherwise the photographic image gets lost in the zillions of photographic images we are subjected to on a daily basis.